"These are not a sweet waffle! I use them to serve creamed beef or chicken for a quick, easy supper. They are very light, very tasty, and they smell heavenly." In a large bowl, stir together the flour, baking powder, baking soda, garlic salt, parsley, rosemary and tarragon. Stir in the shredded Gouda. Set aside. In another bowl, mix together the egg yolks, buttermilk, sour cream and vegetable oil until well blended. Pour the wet ingredients into the flour mixture, and stir until just blended. In a separate clean bowl, whip the egg whites until stiff peaks form. Fold into the waffle batter. Heat the waffle iron, and grease with vegetable oil spray. Use the recommended amount of batter for each waffle according to your iron. Close the lid, and cook until golden brown. 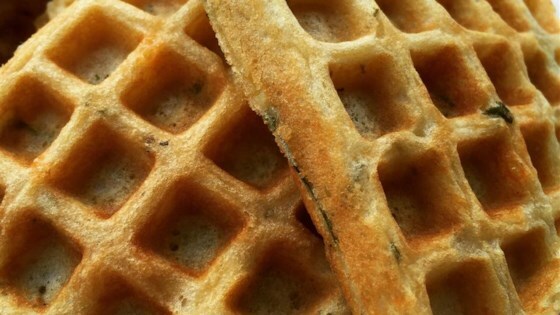 Waffles can be held in a warm oven while the others are cooking. Serve with creamed beef or chicken. Wake up to a classic breakfast treat that's easy to make. I am sorry to say that we really did not care for the waffles. I made them to go along with spicey fried chicken and was very disappointed. This was a great recipe....I don't think the other person who reviewed it understood what to do with the waffles!!! I made these with scrambled eggs and they were really good. Next time, I'll try them with an actual creamed dish. And to the person who made them with spicy chicken--did you read the description? Great recipe! I used whole wheat flour and sharp cheddar cheese. We'll be making these again!